If you ever want a prime example of middle-book syndrome, this is it. V. E. Schwab has created a wonderful world in A Darker Shade of Magic, one that deserves to be explored in more depth, and with characters that I couldn’t get enough of. So my hopes were high for this second volume to get more world-building, more character development, more magic. And… I guess all of these things are there, it’s just that there’s no actual story surrounding them. First sentence: Delilah Bard had a way of finding trouble. Lila did it! She’s on her way to become a pirate on Captain Alucard’s ship and she is exactly as Lila-like as I remembered her. I’ve been waiting a year for a reunion with these wonderful characters and, let me tell you, Lila’s entrance is bombastic. A Gathering of Shadows starts out strong, at the same time showing us what our favorite thief has been up to as well as introducing new characters and a bit more of Kell’s world. Sadly, this is where it goes downhill. The blurb and the beginning of the book promise a big magical event – think Triwizard Tournament of Red London, with lots of competitors and magic used like in The Last Airbender. I was super excited to read about this, especially when it becomes clear that both our heroes snuck into the tournament as competitors. However, this event does not happen until well into the second half of the book. The same goes for a reunion between Kell and Lila. I understand that building tension is a good thing, but believe me, hundreds of pages of dangling that glorious moment in front of my face, when I know it’s going to happen eventually, is really annoying. Instead of giving us the same fast-paced exciting funride she did in A Darker Shade of Magic, V.E. Schwab lets her plot meander. This is the mother of all middle books. It takes ages to get going, clearly sets up a new threat but doesn’t progress it until the last chapter, it gives us a handful of great character moments and some battle scenes that were way too short for my taste. Add to that the cliffhanger at the end and you have a book that should not exist the way it does. All of the actual plot could have easily been told in flashbacks while the overarcing story continues. If you edit this book down to only the necessary bits – and I’m including character development and world building scenes here as well – it would have been maybe 150 pages long. The rest is frilly decoration, keeping back story for… I don’t know why actually. But if you remember the thrilling joy A Darker Shade of Magic gave you, this book is almost a slap to the face. But. I can’t say anything bad about the characters. I just love Lila and her frankly insane ideas. Her disregard for her own safety baffles me but it makes her an exciting person to follow. 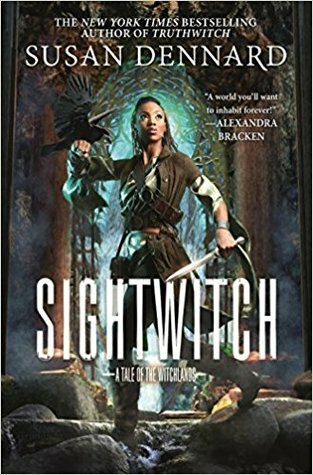 And she does grow in this book, not only because she discovers her own magical abilities and just how far they go, but also on a personal level. It was always Lila against the world but now there are people she cares about. Possibly even better than her is the introduction of Captain Alucard. What a character! I adored him from the first moment he entered the book, but I completely fell in love with him when we find out that there might be romance in his future. Please, please, let there be romance in his future and let it be the one I’m hoping for (no spoilers, so you just have to trust me here, it’s a good one). As much as Lila gets to grow, this isn’t a good book for Kell. Of course the aftermath of the first book doesn’t make life easy for him. But Kell used to have a spark, he used to be a smuggler. An honorable smuggler, sure, but he lived dangerously and he was a multi-layered character. Now, not so much. The tensions in the royal family disappear, mostly because the king and queen make it clear to both Kell and Rhy who is important to them and who they consider a son. It’s heartbreaking, really, even though the thought was always there, in the back of Kell’s mind. But apart from the Elemant Games and the heart-stopping last chapters, nothing much of consequence happens to Kell. All of this leaves me rather disappointed. I’m sure the third book will be better, because it had an entire novel building up steam for it. And the second half of A Gathering of Shadows was fun to read. The magic battles, the scenes when characters finally see each other again after a long time, the ending when many useless chapters of impeding threat come to a conclusion… it’s all good. The dialogue is snappy, I adore the new character, and I just love the world Schwab has created. But the reason I still kind of liked this book is mostly based on my love for its predecessor. A Gathering of Shadows is not a very good book, not even a very good second part of a trilogy. It doesn’t progress the plot, it meanders constantly, lingering on useless moments, holding out on the readers for just a little too long, and it ends with a cliffhanger, which I simply think is cheap but which was also obvious as, unlike in the first book, there is no real plot arc for this book to stand alone. I’m convinced the next book will be better even though I’m worried that Schwab has to cram all the plot she didn’t give us now into one book. There’s also a lot of character work still to be done as we only got teaser moments so far. But with such refreshing characters, even when they wait around an entire book for the plot to pick up again, I can’t really hate the book. Yes, I am sad that it wasn’t what I’d hoped for, but at the same time I got to see Lila and Kell and Rhy again, and that’s worth a lot of brownie points. Oh gosh! This is not very encouraging — another of my bloggy friends said they liked the first book but LOVED this one, so my expectations were a little high actually. I like-not-loved the first book and figured this second one would help me decide my ultimate feelings about the trilogy. I wanted it to be thrilling and fast-paced though! Bother!